Girl Scout Cookies are impossible to not eat. Whenever they're in my house, I will eat them day and night until they're finished. Sometimes you eat them for breakfast too, don't lie! 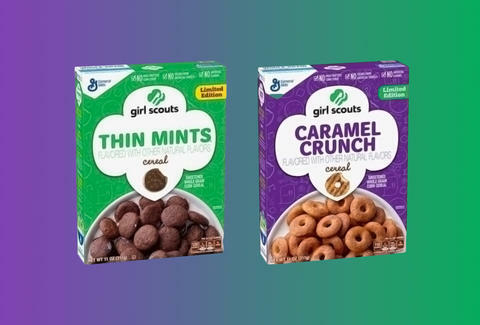 Well, General Mills clearly knows this, because the breakfast kings are about to release Girl Scout Cookie cereal in two flavors: Thin Mint and Caramel Crunch (aka Samoas-flavored). Here's what we know so far: the sweets-crazed Instagram account Candy Hunting found two stock images of the cereal. We reached out to General Mills for comment about the cereals, and the company confirmed that both will be available nationwide in January. Hurrah! Girl Scout Cookie season begins in the next two to three months for much of the country, and by that time you'll also have a GSC breakfast cereal to complement your stockpile of Thin Mint boxes. Lee Breslouer is a senior writer for Thrillist, and wants Thin Mint cereal right now. Follow him to breakfast: @LeeBreslouer.